Perhaps it's down to the topsy-turvy nature of fashion - that means designers show their spring looks just as Autumn is fully setting in - but I've been noticing a lot of crossover pieces recently. There are now, of course, even transitional collections like pre-fall and resort. Then again, perhaps this is finally a move towards practicality in high fashion; the weather does not always oblige us when we're trying to dress well. 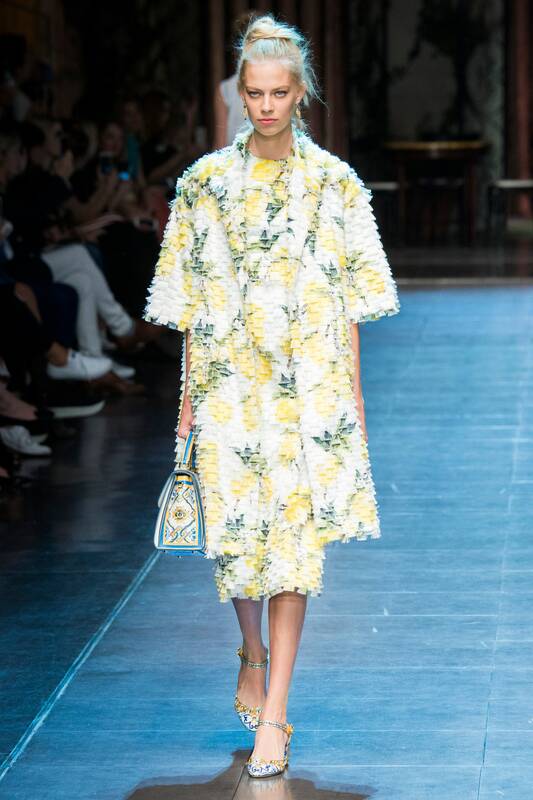 In the latest collections from Milan, a particular item has stood out for me: a summery coat. They're at Gucci, flirtily half-covering silk slip dresses; they're at Versace, layering up a military-inspired look, and they're at Dolce and Gabbana (above) in delicious patterns with matching dresses underneath. The real beauty of this trend is that these coats don't need to be worn in summer at all. The point is that they're enough of a statement on their own, whether you're putting them over thick layers to stay warm in December or adding them to a barely-there evening outfit in June. They're coats for sunny days like today: a bright, cool, autumnal day which feels very fresh. One wants to feel wrapped up and ready for the cold outside, but it's too early to adopt the heavy materials and colours of Winter. So I've been on a hunt and found a few of the best coats you can buy right now to stay chic on these cold sunny days. I actually recently bought this myself. There are other colours, including camel, but I loved the grey because it's so versatile. It's also reminiscent of men's tailoring, which makes it a good option if you need something smart but simple. The details are what really got me though; the underside of the collar is two-tone dark grey and camel, the kind of thoughtful addition that really makes this coat look more expensive than it is. Tapestry coats are love-or-hate items. you either feel like an opulently adorned medieval noblewoman, or like you've stolen a carpet from a pub. It's worth looking out for these in charity shops and vintage stores, but if you want something new this Hobbs piece is a good way to go. Pair with smoking-slipper style shoes for that Oscar Wilde aesthetic. Perfect for enacting all your Clueless/Legally Blonde fantasies, a pink coat is a sure way to stand out. I like this one because the texture does all the work for you, and you can keep the outfit relatively simple, either sticking with the pink theme or matching with other pastels. Like the idea of a bit of colour but wary of going OTT? This coat cleverly weaves a bit of yellow into a classic grey tweed. From a distance, it just gives the whole colour a a nice lift, but when you get close you can see colour in the material. Again, it's those details that make a good coat worth it. I came across this Spanish brand while in Madrid this summer, but they deliver to several other countries. They have the cutest prints and bright colours, which makes the shop a joy to browse. This trench is a good bet for days when the temperature might vary, and its bold cold choices are very fresh. Check out the rest of Kling's stuff if you like that Saoirse Ronan in The Grand Budapest Hotel kinda style. It's that time again. My latest post, a review of McQueen on the West End has been selected for this week's Links a la Mode. 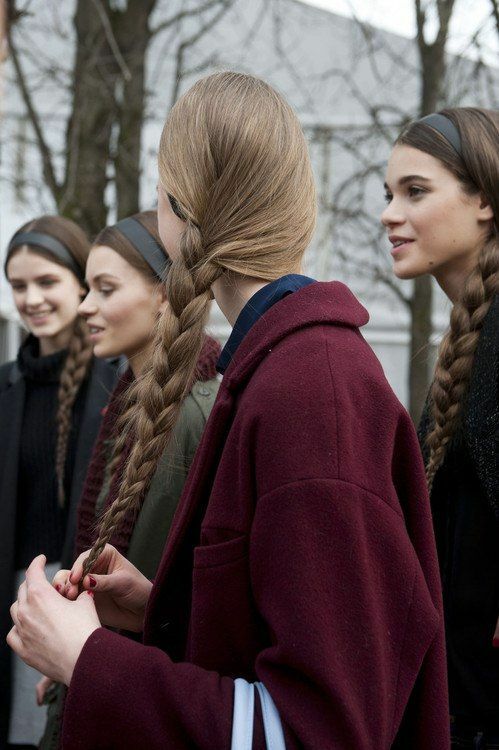 As ever, IFB's roundup features some pretty awesome blogs, including a lot of NYFW reports. Have a look through, and have a great week! Happy. Pretty. Sweet. : Inspired by The Man from U.N.C.L.E. Tales of Two: 90’s Baby… The Flared Denims are Back! It's London Fashion Week. Everywhere you go in the central London area, one can spot models waiting between shows, shiny Mercedes Benz official cars, and show attendees dressed in their best Autumn/Winter looks, hoping to attract a street-style photographer. In amongst this, a play is running in the West End, not far from the shows in Soho. It focuses on Alexander McQueen, one of Britain's most legendary fashion designers. McQueen was first performed at St James Theatre, and though it has now transferred to the Theatre Royal Haymarket, it seems the fashion world has moved on; it is almost fitting, for a play which contains many meditations on the double-edged sword of fame and the ruthless ephemerality of the fashion world. The story is simple. On a night a few years ago, Lee, better known as Alexander McQueen, encounters a woman attempting to steal one of his designs. Together they embark on an improbable journey through London, encountering demons and ghosts from McQueen's past. It's a fictional narrative, based on the life and work of its protagonist. 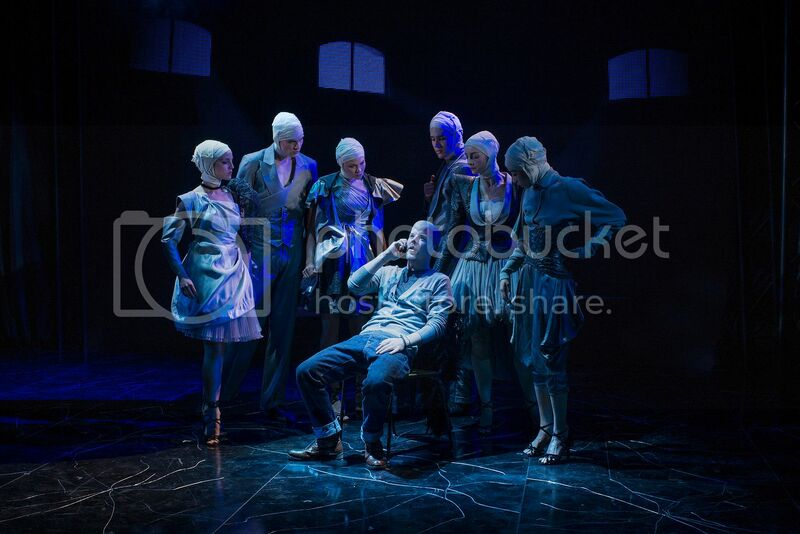 Let me say, first of all, that this is not the play to see if you want to know about Lee Alexander McQueen. One day I'm sure there will be a Coco Avant Chanel-esque biopic to tell the story of his life, but this play instead uses the fascinating life of the designer to explore dark topics, particularly fame. In one scene, Lee berates Dahlia (the dress thief) for thinking she can speak about Isabella Blow's life and death after five minutes of Googling. The same thought comes to mind about this play itself. It makes a bold effort to understand McQueen, a mission which is lent strength by Stephen Wight's excellent performance. But the biographical details are, for those with at least a passing interest in McQueen, things we've heard before: his relationship with Blow, the Savile Row training, his closeness with his mother. That doesn't mean any of these things are unimportant or untrue, but given the whimsical concept upon which the play is based, it is strange that writer James Phillips did not choose to be more creative with the details of McQueen's life. That's the problem with turning a living or recently living person into a character: it seems disrespectful to smudge the truth about them, and yet what we understand as the 'truth' about them is based on a handful of details which make up their Wikipedia article. To get at a deeper level, and to turn that person into a character, it might be necessary to employ a bit of poetic license. Where the script shines most is when little details are used to give us a better understanding of Lee. In a scene set on the roof of a London building, he tells Dahlia about his days birdwatching and looking out over London as a young man. 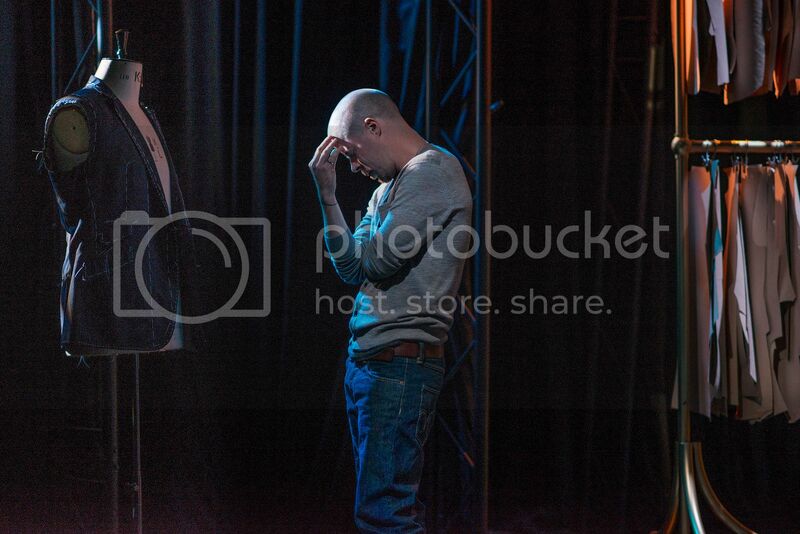 It's a small detail - and a true detail - but for me it was one of the most telling moments of the play. As well as creating a vivid image of the boy birdwatcher, it also ties together the other references to birds both in the play and in McQueen's body of design work. Another highlight for me is Lee's conversation with the already-deceased Isabella Blow (who is portrayed wonderfully by Tracy Ann Oberman). She describes another a small moment which provides us with a vivid image: the two of them practicing falconry at her country home. It seems to say so much in just a few lines, and I wish there had been a few more moments like this in the whole play. Sadly, I did not find Dahlia very easy to sympathise with at all. Perhaps it's because she's not a real person, or perhaps it's because her lines seem a bit contrived (every time she swears it feels bizarrely unnatural). I heard one audience member describe her as the "idiotic American girl" during the interval. It's a shame, since she provides the concept for the play, and is certainly necessary to prevent the whole thing from becoming one long monologue. If you've ever heard of the Manic Pixie Dream Girl trope, that is what Dahlia is. Phillips tries to give her depth, but she ultimately falls flat in comparison to the real-life figures of Blow and McQueen. But before you despair of this play entirely, let me speak about the production design. 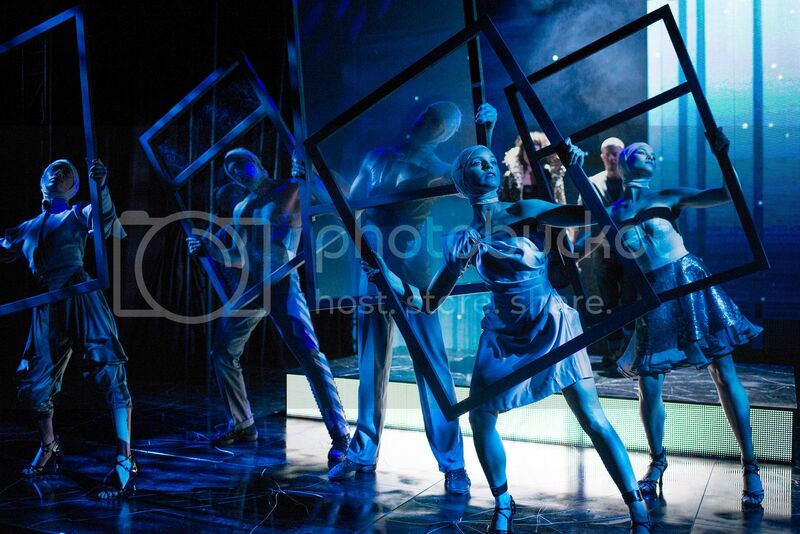 As is suitable for a designer whose shows were renowned for their theatricality, this production looks incredible. Lighting, projection, and TV screens are all used to great effect. Add in a few choice props and the stage is transformed into a Saville Row tailor's, a London Underground train, even the mind of McQueen himself. The Haymarket is an ideal location for all of this - as Phillips says, "It really is one of the most beautiful theatres I’ve ever been in." 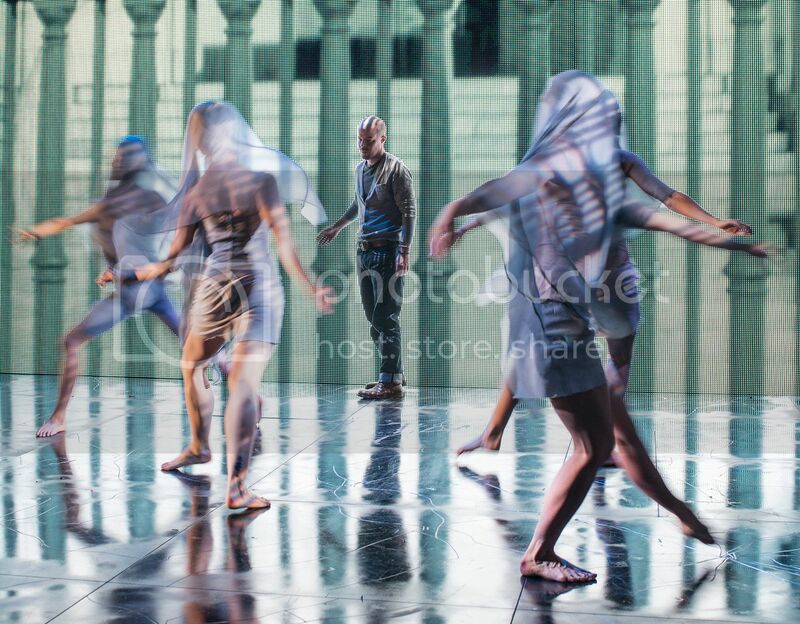 Best of all is Christopher Marney's choreography. I have never seen such beautiful use of human bodies in theatre. It blends the movement of fashion models with balletic influences, and in the process the dancers seamlessly change the surroundings to move us from one scene to the next. Of course, I cannot finish without talking about the costumes. The use of McQueen designs is sparing, and rightly so. To fill the stage with beautiful clothes would detract from Lee who is, in his own words, "wearing the worst clothes in the room". The key pieces are a gold coat, which many people will recognise as being from his final collection, and the red dress with a feather skirt which was worn by Erin O'Connor in Spring/Summer 2001. 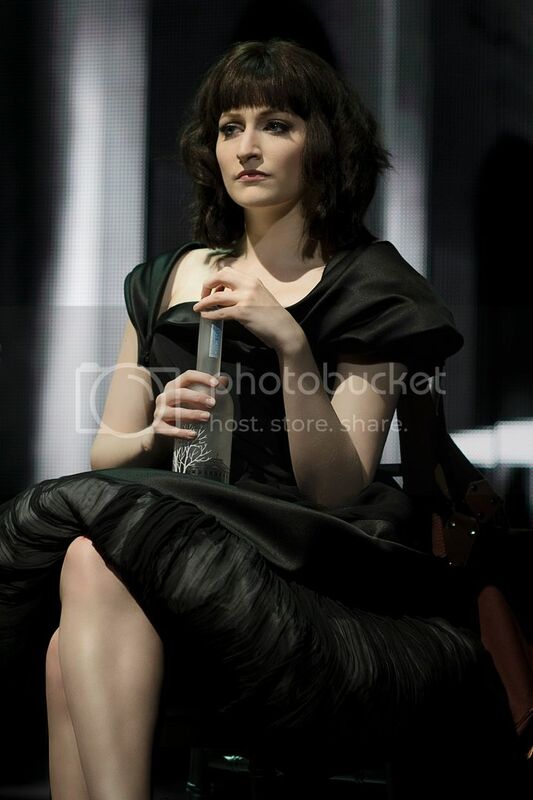 Yet the most stunning sartorial moment occurs when Lee builds a black dress around Dahlia which she wears for the rest of the play. It must have taken some serious technical work and a lot of practice on Wight's part to make it look like he is cutting fabric by eye and turning it into a piece of couture in under five minutes. This is a play which I found worth seeing, despite its flaws. And at a time when Savage Beauty has made history as a blockbuster exhibition, this production contributes to the inevitable rise of the cult of McQueen. There will certainly be more tributes to the late great designer, and if they carry his influence in the same way McQueen does, I can see him becoming the most legendary icon of fashion since Chanel. My summer is almost over, but there was just about time for a short city break with my friend Holly. If you're looking for a place you can do in a few days in Europe, I cannot recommend Madrid enough. I bought a new backpack just before we left, as I wanted something a big enough for all my bits and bobs, and overstuffed shoulder bags are the worst. Aside from the essentials (passport, money, phone), this is what I was carrying around. Sunglasses - Another new purchase. I used to have some a bit like this, but lost them at some point last year, so I decided to go for even bigger frames. It's the Anna Wintour look, darling. Maybelline Baby Skin - As the tube makes clear, this is a product for adults only, despite its name. It's a "pore eraser", kind of a light tinted primer - it's even lighter than BB cream. I really like it, as I hate wearing makeup which seems to sweat off whenever I feel a bit hot. It was especially good to have this in Spain, where it was about 10 degrees hotter than at home! Leaflets - We did all sorts of things: drinks at a rooftop bar overlooking the Palacio Real, wandering the Reina Sofia art gallery, a trip on a cable-car over the edges of the city. In this picture, you can see a map of the Botanical Gardens, where we spent a very peaceful afternoon, and a leaflet about the Moche Art exhibition at Caixa Forum - a museum which is worth visiting just to look at the inside of the building! If you head over to my Instagram, you can see a few of my favourite spots in Madrid! We live in an age which moves so fast that by the time we have managed to process the new, it isn't new any more. Understandably, this dismays a lot of people. Even the most tech-savvy and up-to-date of us can have their moments of doubt, and it can be beneficial to stop and think about what the implications of each new change. But I have to say, I am getting pretty bored with seeing the same concerns over social media. Especially when they're about the pressure to have a perfect life which Instagram and Pinterest supposedly exert onto us. The latest of these is a piece in the New York Times, which suggested that pictures of happy groups of female friends - emblematised, of course, by Taylor Swift's 'girl squad' - are replacing those of happy couples. The writer, Emily Witt, suggests that these images are increasing our insecurity about our lives: "The portraits seem to be asking a lot of impolite questions: Do you have as many friends as we do? How did you celebrate your birthday?" Firstly, I simply do not agree that a proliferation of images of female friendship is a bad thing, even if they are all clothed in Chanel or hanging out at a champagne bar. Promoting friendship is surely a good thing, because having a supportive network of friends is such an important part of life. I do not agree that posting pictures with your friends on social media is "friendship as performed" - it can be an expression of happiness in the moment. Or, as I've experienced a lot in this transitional phase of my life from school to university to life, it can be a way of preserving a memory. Perhaps most importantly, when women are so often portrayed in the media as competing with each other for the attention of men, is it not a positive step to see more women celebrating their friendships? Secondly, have we not yet learnt that nobody's life is perfect? We need to accept that when people post something on social media, they are editing their lives for public consumption. We all have a right to do that: choosing what to keep private and what to show. Social media posts do not have this malicious intent that many cultural commentators seem to be reading into them. Just because you see a picture of two friends having a night out, there's no need for you to feel bad about spending an evening alone. For some reason we have arrived at this assumption that social media is inherently bad for us. We are, apparently, addicted to gazing at beautiful images and judging ourselves harshly in comparison. I don't doubt that this happens to everyone at some point; we've all had our low moments of feeling left out or unfulfilled. But this attitude totally neglects the positive ways in which social media keeps us connected: staying in touch with friends all over the world, following the life of someone whom we admire, and even meeting new people. As for beautiful images, our interaction with them need not be destructive, but rather aspirational. Recently I read a money-saving tip on The Financial Diet which advised supplanting your impulsive shopping habits with Pinterest. Perhaps that sounds silly to some, but I find it really works. Whatsmore, when I find I really want to purchase something, gathering inspiration from the blogosphere is incredibly helpful, allowing me to get a sense of the features I need in a piece of clothing, and what I want it to look like. Never mind if I'm Pinning a piece of Elie Saab couture that I'll never be able to afford, the fact I'm attracted to it helps me sift through my options with a keener sense of what I'm looking for. In fact, the majority of young women also see the benefit in using social media for this sort of purpose. Teen Vogue's social media survey showed that girls use various outlets to research their purchases by watching tutorials and reviews on Youtube, finding more images on Pinterest, and looking for discounts on Facebook. To me this seems to counteract the stereotype of the young woman obsessed with Instagram, desperately trying to get hold of the latest 'it' buy. We might see things on Instagram at first, but social media allows us to research our purchases and make an informed decision. Whether it's a group of celebrity friends or a must-have handbag, our lives are filled with perfect images. That shouldn't make our lives any less wonderful. These apps and websites were made to be enjoyed, not to hold us back. It's September, and despite this being the third (and final!) year that I won't go back to studying until October, it's difficult to shake off that distinctive back-to-school vibe. Few times of year flood my mind with so many readily-associated images: brand new exercise books to be personalised; the walk through my local park to school as the leaves begin to grow golden and the promise of conkers looms; desperately wanting to buy everything in Paperchase, and queuing around the block for access to the one tiny branch of the school uniform retailer. I see no reason that adults shouldn't carry this sense of excitement and anticipation into their everyday lives. It may not be long until my world doesn't revolve around academic years, but perhaps if I just allow myself a little treat around this time of year, I'll regain that feeling of new-ness. Here I've gathered some of the most desirable back-to-school items I could find. If you like them, have a look at my Study Inspiration and Autumn/Winter boards on Pinterest where you'll find lots of similar things! Blame the Sports Luxe trend, or maybe it was the Americana trend. Whichever it was, despite living in England all my life, I'm a tiny bit obsessed with American-style sporty clothes. Whatsmore, jackets like this are such a good cover-up because they aren't as slouchy as a hoody but are still easy-going. I like this one from Nordstrom in particular because it mixes British and American influences by combining the Tweed contrast knit with the sleek shape. I used to hate wearing a backpack. I felt like a tortoise lumbered with a shell several sizes too big, and often worried that if I fell over I would never get back up. When I made the long-desired switch to shoulder-bags, I felt a little better, except that now everything was much heavier as it had to be carried on one shoulder. 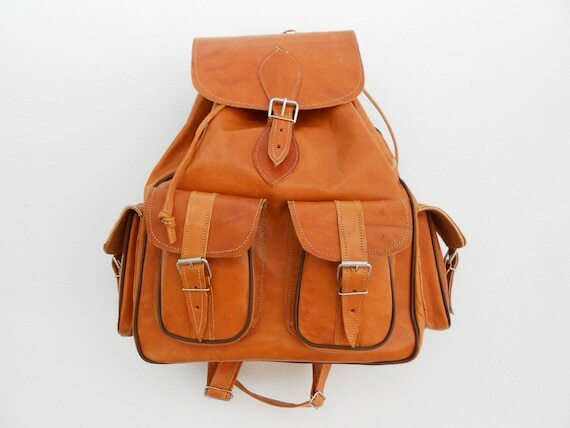 Really what I needed was the perfect backpack, and this shop on Etsy has some beautiful ones in different colours. I chose this burnt orange one as it reminded me of autumn leaves, but was seriously tempted by all the others. I'd love something like this for putting books in when I need to cycle across Oxford. Most people I know now use pads of A4 lined paper or just type everything straight onto their laptop. I do that too, but last year found a stationery shop where I could get traditional exercise books, which really help me get my thoughts in order. I especially like the ones with plain pages as I love doing little mind maps before starting an essay. If you're interested in those you can get them cheaply here, but for the purposes of this post I wanted to choose something a little more indulgent. 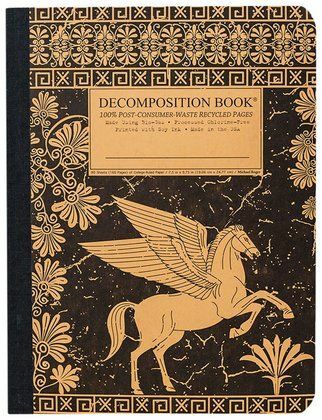 I've had my eye on these Decomposition Books for a while; the way they play on the classic composition notebook is very appealing, and I especially like this one with echoes of Greek art on it. I miss studying Classics sometimes, so it's nice to have a reminder of it. Anyone who's ever encoutered Out of Print Clothing will know that it's practically impossible to pick just one thing from the site; do have a look if you fancy decorating your dorm with a Pemberley pennant or wearing a Great Gatsby sweater to class. I chose socks because they are an often undervalued element of a good wardrobe, but are essential for a new academic year, whether you're wearing them underneath Winter boots for walking to the library or just keeping your feet warm during evening study sessions. 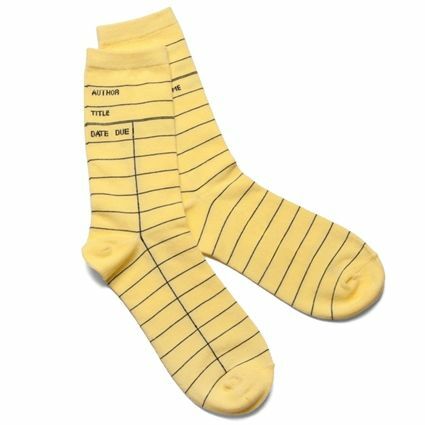 These aren't just cute, the library checkout card can even keep your mind on that book you need to return! One thing I don't miss about school is the uniform. Although in a way, we all create our own uniform based on the key pieces we wear every day. My personal uniform, as most people who know me will attest to, is a skater dress, often with tights. I love them because I just need to put them on to feel ready for the day. I'll add a cardigan if I'm just going to a lecture, or a nice jacket and heels if I'm going to an event. This dress is my sort of thing, in that it's quite plain and easy to match with things, but the embroidered detail at the neckline adds enough that you don't even need to accessorise if you don't want to. It's from a brand I hadn't heard of called Fallen Star on ASOS.